These Bible verses reveal that God has been speaking about the Roman Catholic Church for 2,500 years, the first instance occurred when He spoke to Daniel about future kingdoms that would occur until the end of time. If you’re Catholic, these Bible truths are shared out of love for you, because you may not know what God has declared to you in His Holy Word. Read through the list and see what the Bible reveals about the leaders of the Catholic Church. You don’t have to understand all of the prophecies and their fulfillment, just simply read through the study to see how the Bible specifically describes the Catholic Church. The Bible foretold that the church of the antichrist would be are arrayed in purple and scarlet, and adorned with precious stones. The Bible foretold that the Harlot (false Church) would assert power over ALL of the Earth. The Roman Catholic Church has ecclesiastical power over 1.2 Billion people, who live in the nations of the world and speak different languages. The Roman Catholic Church is both a Church and a City, which kings of the Earth bow down to. 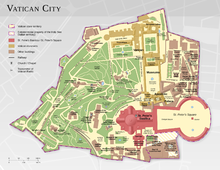 Vatican City is a city-state, making it the smallest country in the world, that has political relations with almost every country. Kings and President bow to the Pope when they visit Vatican City. Daniel 2:41 describes them as the Iron/Clay feet of the statue, as they are a Church/State. The other parts of the statue in Daniel 2, the gold head of Babylon, the silver chest of Medo-Persia, the bronze waist of Greece and the iron legs of Rome, were only political empires. The iron/clay feet represent the church/state of the Roman Catholic Church, which emerged after the Roman Empire was destroyed. The Roman Catholic Church rose to power after the Roman Empire split into 10 kingdoms, fulfilling Daniel 7:24. Out of the ten kingdoms, the Catholic Church emerged, who was different because it was a church/state. The Roman Catholic Church is the Little Horn of Daniel fulfilling Daniel 7:8. The church has a single man (the Pope) acting and speaking for the whole body, fulfilling Daniel 7:8. The Catholic Church changed the calendar and law, fulfilling Daniel 7:25. At the First Council of Nicaea in 325 A.D. they changed the calendar to be based on the Sun, not the moon as God ordained in the Bible. At the Council of Laodicea in 363 A.D. they made Sunday the “Lord’s Day”, instead of 7th day Sabbath as God ordained in the Bible. In the Catechism, they removed God’s 2nd Commandment, which forbids idol worship, as they have many idols such as Mary. They then divided the 10th Commandment into two parts, so there is 10 total. They claim that the Roman Catholic Church was built on Peter. But Jesus said in Matt. 16:18, “you are Peter (Greek word “Petros” or little, movable stone) , and on this rock (Greek is “Petra” or unmovable stone/rock, which is Jesus) I will build my church. The two Greek words have very different meanings, one represents Peter as a little movable stone, but the Bible is telling us that Christ’s Church is built on the bedrock of Jesus. Peter himself understood that Christ was the only foundation stone and that he himself, and the rest of God’s Chosen Ones, were little building blocks upon that foundation. The Catholic Church claims that Peter was the head of God’s church. Paul says in Ephesians 5:23 that Christ Jesus is the head of the church. and he is the saviour of the body”. They claim that Peter has the keys of heaven and earth. Jesus says in Revelation 3:7-8 that He has the key of David, and it is only He that opens and shuts. He who opens and no one shuts, and shuts and no one opens”‘. They deny that Jesus has come in the flesh, fulfilling John’s definition of Antichrist in 1 John 4:3. By claiming that Mary was sinless from birth until she was taken up into heaven, they are saying that Jesus would not have inherited man’s sinful fleshly nature. Christ’s perfect sinless life and His victory over sin is of no merit if He did not inherit man’s fleshly nature. They are not saying that Jesus did not live in a fleshly human body, but they are invalidating that He overcame man’s sinful fleshly nature. The Roman Catholic Church rose to power after the Roman Empire was removed, fulfilling 2 Thessalonians 2:7. Paul used the word ‘he’ because if he would have said ‘until the Roman Empire is taken out of the way’, it would have invited persecution against the Church, from the Romans who would not tolerate a claim that they will be destroyed.. The Pope sits in the temple of God proclaiming to be God, fulfilling 2 Thessalonians 2:3-4. 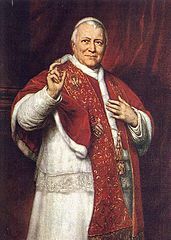 Many Popes have declared that salvation is only through the Catholic Church, which denies that salvation is through Jesus Christ. This is declaring that a Christian in any other church is not saved, and it effectively eliminates Jesus as the only way to salvation, which is antichrist. The Popes title of Vicar of Christ is the ‘antichrist’ in John’s epistles. The word ‘antichristos’ is the Greek word for Antichrist. Translated into English it means Vice-Christ or Vicar of Christ, which the Pope has claimed as his title. The Roman Catholic Church ruled supreme for 1,260 years, fulfilling Revelation 13:5, which is speaking about the Antichrist beast. 42 months is 1,260 days. In prophecy, 1 day = 1 year, so it’s 1,260 years. In 538 A.D., the Roman Catholic Church gained religious and civil power when Emperor Justinian issued a decree making the Pope head of all churches. In 1798 A.D., Napoleon’s army marched into Rome and captured the Pope, ending the reign of the Papacy. The Pope was stripped of authority and taken into captivity, causing a mortal wound, fulfilling Revelation 13:3. They were restored to power in 1929, which healed the deadly head wound. Popes speak great things and blasphemies, fulfilling Revelation 13:5. The Roman Catholic Church is the beast and the Pope is the man in Revelation 13:18. Vicar of Christ in Latin is ‘Vicarius Filii Dei’, which equates numerically to the number 666. Rome is seated upon seven mountains, fulfilling Revelation 17:9. They are the Whore of Babylon who is drunk with the blood of the saints of Jesus, fulfilling Revelation 17:6. Daniel 2:34 declares that the feet of iron and clay, the church and state of the Roman Catholic Church, will be destroyed by Christ in the end times. Revelation 18:21 is the fulfillment of Christ destroying the Roman Catholic Church, which is called Mystery Babylon. As you have clearly seen in the study, the Roman Catholic Church is the false church which opposes Christ. And the Lord has foretold that He will destroy her and all those in her. This is a very important message on Biblical salvation. Are you saved? Do you know your eternal destination? If not, this video is a must see! Secure your salvation by a direct relationship with Christ Jesus, instead of through men. Repent of your sins against the Lord, who alone is perfect. Click here to save and print a PDF that summarizes this page.